In The Networks you are the head of a fledgling television network and quite frankly you have nothing good to watch. Shows like “Get to Know Your Lower Colon” are the best you can offer, but you aspire to greatness and those aspirations will take you far in life … or at least in the game of The Networks. Each turn will consist of grabbing the best possible stars, shows, ads and network cards to help your little network become the most dominant network on TV with the most viewers. What is The Networks like? 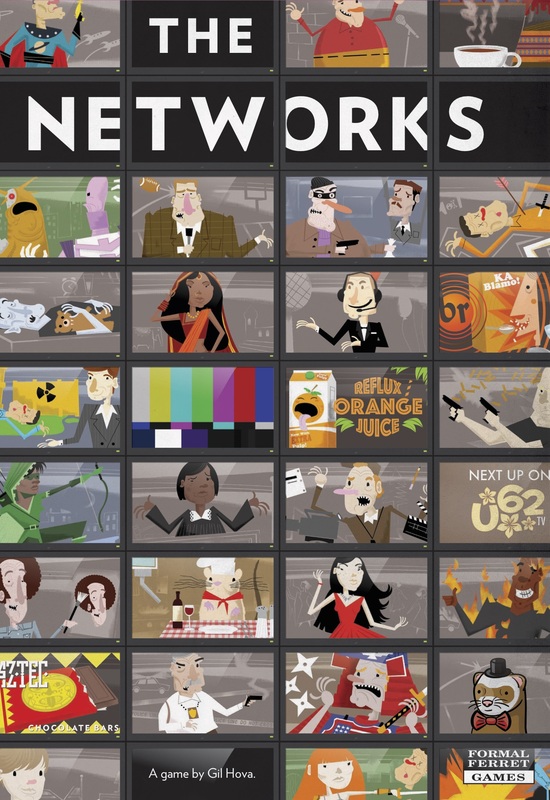 The Networks is a card drafting game. It is however not in the style of 7 Wonders, but more in the style of Through the Ages. Like in Through The Ages you draft one card at a time from a set of available cards. The Networks is not nearly as heavy a game as Through the Ages though. A limited number of cards are available in each of the game’s five seasons (rounds). Each turn consists of one action. On a player’s turn they can: sign a star or get an ad and put them in the greenroom. The greenroom is a holding spot on your player board for stars and ads that can be assigned to shows you develop later. They can attach stars or ads in their greenroom to existing shows from your green room. Alternatively they may take a network card which gives end game scoring or an immediate or one-time use bonus. Lastly they may chose to immediately develop a show. Each star, ad and show have some restrictions to their use. In order to get the most out of them you must keep their requirements in mind. Some stars will give their best effort in a specific genre or if they are the only star on the show. They will still work on other shows, because a paycheck is a paycheck, but they do their best work in very specific circumstances. Ads and shows also have restrictions, but it is for specific time slots. An ad in the preferred time slot will give you more money while a show in the preferred time slot will give you more viewers. As you are filling out your 8, 9 and 10 PM slots you want to keep on the lookout for ads and shows that give the most for those time slots. Each show has requirements in order to be developed. They need to have some combination of one or two stars/ads attached to it before you can develop the show. If you don’t have the actor/actress/ad that you need waiting in the greenroom then you can’t select the show, so you may lose out on that perfect show. Once you have been able to develop some shows if you manage to get 3 or 5 of the same genre then you get some bonuses. Each action in the game is simple, but knowing when to choose each action is the difficult part. Everyone has access to all of the cards in the middle of the so if you see a show you absolutely must have you might have to decide between taking it over the star you really want as well. One of the cards may not be there on your next turn. Then again it may, so deciding what is worth the risk and waiting to take may make the difference between a win and a loss. When a player no longer wants to take any actions they can drop out of the round and score. The sooner you “drop and budget” the higher money or viewer bonus you can get, but drop out too soon and you may be giving another player a huge advantage. Drop too late and you may be scrounging for money in the next round. After everyone passes you gain viewers and money through your shows and ads before aging each show. Shows popularity change as they age (which makes perfect sense), but even after they age out of your lineup or you choose to get rid of them they give you a little bonus the next season as a re-run. After five seasons are over the TV network (player) with the most viewers wins! If you just look at the mechanics of the game it is a very solid game. The decisions you have to make can sometimes be very tense. When you accurately anticipate the card the other players really want and snag it away from them before they get the chance and you see their face scrunch up in frustration…yeah, that feels really good. There are some pretty tough choices to be made, but none so difficult that it lends itself to analysis paralysis (taking too long analyzing every possible decision before making a choice). Sure, that one person in your group could still analyze the heck out of this game, but since every turn consists of one action, typically you won’t have to wait long before your turn. If you look beyond the mechanics of the game, this is where it gets absolutely brilliant. I love a dry cube-pusher as much as the next guy, but this game isn’t that. Sure, the mechanics could be used in a dry cube-pusher and it would still be great. But when you read some of the show titles you will know why this game has me reading every single card. Half the fun is announcing what actor/actress and ad are paired with what show when you develop it. One of my favorites was: the Awesome Industrial Accidents TV show with the ever popular Shaggy’s Rugs and Carpeting ad. Every choice you make has you thinking about what is best for you and the other players which causes some pretty tense decisions on your turn, but also hoping the card you didn’t take lasts until it gets back to you. Each turn is quick, keeping the game moving along at a swift pace. The names of the ads, stars and TV shows have literally made me laugh out loud which adds a light-hearted nature which is not typically found in strategic games. Finding the right combination of stars, ads and TV shows for the right time slot almost feels like a victory in itself when you are successful. The funny titles can cause people to stop and read everything that comes out which can be funny, but also can take a while. The scoring at the end of the round can be a bit complicated when considering the bonuses for correct time slots, what season the show is in and what the actor/actress adds. That being said, the designer did include a paper calculator on each player’s board to help add it all up. The Networks is a step above a family level game, but because each turn consists of only one action each turn is greatly simplified. Deciding the best action to take is what makes it a little more complex than average. I can’t wait to play this one, after reading your review. It’s sounds really funny AND a challenge! You definitely should Eline…obviously I love it!